Why are “diversity” and “inclusion” such buzzwords at corporate boardrooms these days? And can they really impact a company's bottom line? How? First, let's try and define what diversity and inclusion really mean and how they must go hand-in-hand at work to be truly effective. “Diversity” is about embracing the full range of differences that make each individual unique. Much of the discussion in the public sphere often revolves around gender diversity but as you can see from the graphic below, it is about so much more than that. Beyond the physical, it is also about embracing cognitive, occupational, values, relational and societal aspects of humans as individual beings. “Inclusion” at the workplace is about recognising and fully leveraging the diversity of the workforce in a way that promotes equality and delivers results. Fundamentally, it is about celebrating and utilising people’s differences to the benefit of the organisation, not merely tolerating them. 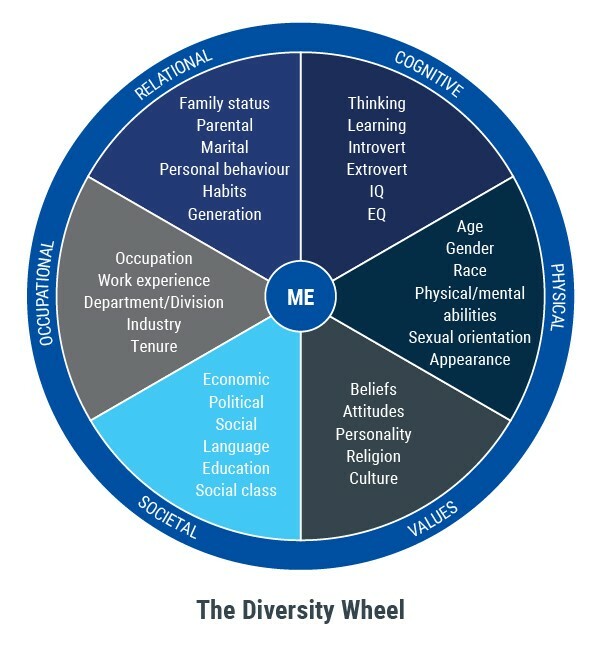 It’s pointless to have a diverse workforce but without fully including and maximising such diversity. So how does diversity and inclusion really impact the company bottomline? Teams of mixed gender, ethnicity, sexual orientation, age, physical abilities, and work-styles are more representative of the customers that companies serve. They offer a variety of viewpoints, they have a wider range of experiences and they produce more innovation. Simply put: A diverse workplace can capture a greater share of the consumer market. Just using two market segments, according to consulting firm McKinsey, women are the driving force behind 70% of household purchases in Europe, and 60% of car purchases in Japan. In Asia, the spending power of LGBT consumers in 2015 was reportedly worth 1 trillion US dollars. In an increasingly global economy, where the best companies hire only the best people, it makes logical business sense to hire from the widest pool of talent. Access to the largest and most diverse set of candidates eventually makes for a truly qualified workforce — talent is borderless, colour and gender-blind! Take, for example, some of the most powerful corporate chieftains in the world. Apple co-founder Steve Jobs was the son of Syrian immigrants. Current Apple CEO Tim Cook is openly gay. Google CEO Sundar Pichai is American Indian. So is Pepsi CEO Indra Nooyi, who is also a woman. The chairman of e-commerce behemoth Alibaba, Jack Ma, is Chinese. Your customers are watching — and acting with their wallets. With social media and an active citizenry, businesses are being held accountable for their every action. As far back as the early 2000s, McDonald's dropped its “Super Size” option and began adding healthier options to its menu after a documentary showcased the dangers of a fast food diet and sparked debate amid health-conscious consumers. In South East Asia, the haze crisis led to the boycott and ban of products made by companies linked to the forest fires in Indonesia and Malaysia after environmentally conscious consumers highlighted links between the two. In 2016, global home-rental company AirBnB introduced an anti-discrimination policy after being slow to address customer complaints of bias and racism. And this year, leading US retailer Nordstrom dropped Ivanka Trump's fashion line of clothes and shoes amid a women-led #GrabYourWallet firestorm over her father's policies. Having a diverse and inclusive workforce is a key talent attraction and retention strategy. Our 2017 Asia Salary and Employment Survey reveals that in today's intense battle for talent, having a strong employer branding proposition is actually key to business success. Not only does it make your company more attractive to work for, a diverse and inclusive workforce can also help reduce costly employee turnovers. Google regularly tops “Best Companies To Work For” lists in part because of its incredibly open and diverse culture. Whether you're the CEO or HR lead or line manager, there are many ways to play your part. At the basic level, build awareness and consciousness about how everyone is different and celebrate that individuality. Diversity education and bias training could be part of onboarding, for example. Fun activities could include organising food fairs to celebrate different cuisines or setting up activity groups such as yoga class or running clubs. The next step up would be to have action and alignment around diversity and inclusion policies. Implement formal processes, systems and policies around diversity and inclusion and keep everyone (all ranks and levels) accountable. Simple examples include allowing flexi schedules for parents to attend to family, dedicated prayer spaces in the office or having disabled-friendly facilities around the office. Now what about you — just how diverse and inclusive is your company?